The Success of any Watershed Project basically lies in its Management . It is infact a challenge to manage the available inputs and existing natural resources in any Watershed Project. What’s the challenge? The target to enhance the efficiency of available inputs and resources to yield best possible outcome is the real challenge in Watershed Management. The Watershed Programme has specific guidelines and has objectives to be achieved .The funds/Budget allocation is demarcated. Along with it, the work /watershed intervention to be addressed is also defined . Still ,in many cases the required result is not achieved . There can be many factors deciding the success of a Watershed programme but the main difference lies in approach for achieving the targets. Approach in Watershed Management ? 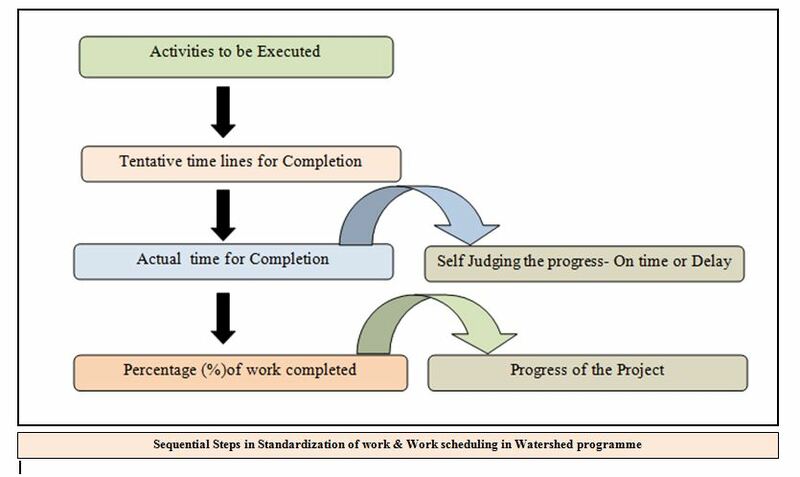 It is important that all the steps required for the successful completion of the Watershed project should first be listed .This way the Project implementing Agency/implementer will know the number of steps required in successful completion of the Watershed project . Next a tentative time lines should be fixed for completion of each steps. While fixing the time lines, it is important to understand the significance of each step. Later on with the initiation of project , it should be seen that in what time period the particular step has been completed against the set time period . The Actual time for completion of particular step should be compared with tentative time lines. This will show whether the project activities are being completed well in time or are getting delayed. Ultimately, it will act as a check point for self judging the timely progress of the watershed Project . Along with this , it is wise to fix percent weightage to each steps . The Cumulative weightage will show the Percentage progress of watershed project at any given time period .